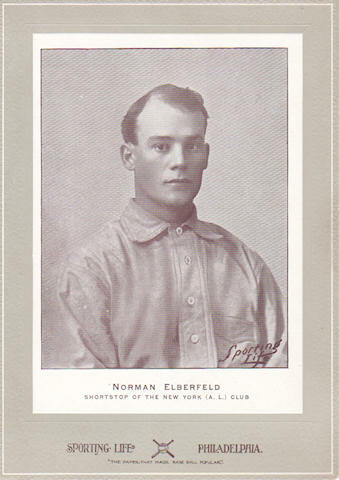 Kid Elberfeld was a baseball player, manager, talent scout and teacher from the turn of the century through 1940 . I have found information on him by searching Norman Elberfeld, Norman Arthur Elberfeld, Norman A. Elberfeld, Kid Elberfeld, The Tabasco Kid, The Tobasco Kid, Kid Elberfield, etc. His name is misspelled on several baseball cards, as well as on the Internet. Norman's nickname was originally "Brownie" but later became "The Tabasco Kid." Shortly after he came to New Yolk AL in 1904, Gotham sportswriter Sam Gant dubbed him 'The Tabasco Kid" for his volcanic temper and combative nature. New York sportswriter Sam Crane dubbed him "The Tabasco Kid" because of "the life and ginger he puts into the game." The web site has many layers, so keep exploring. Many of the images are downloaded from other sites. I try to give credit where I can. You are welcome to use any images from my collection, but you are responsible for obtaining permission if you use images I "borrowed" from other sites. If you are doing research on Kid Elberfeld and need hi-resolution files of pictures I own, I would be glad to supply them. My hope is a talented writer will use this site as a source of information for a book or movie on the life of Kid Elberfeld.